There is a lot of miscomprehension of data going on as it relates to police killings of unarmed citizens in America, especially in relation to race. Time to clear some things up. I keep seeing many white people posting things like “more white people have been killed by police than black people”. In saying so, they seem to assume that they have magically dismantled the whole reason why #BlackLivesMatter exists. Of course it does no such thing. While that simple fact is true, clearly people are not taking any time to think about basic demographic proportions in the United States when making their statements. A little less repetition of conservative media quips and a lot more openness and a true desire to seek understanding can go a long way. Here is where that basic math course available in college, you know, “practical math for life” or something like that, can help us all. 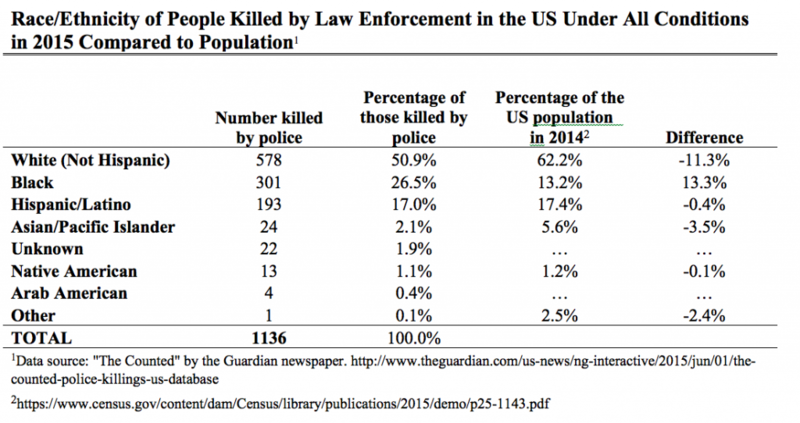 So, 578 white Americans were killed by police in 2015. To understand the actual meaning of this number we must remember that white people are over 60 percent of the American population. BUT 578 white fatalities, while still a problem, only represents 50% of the 1136 total killings of Americans at the hands of police in 2015. That means white people are disproportionately not being killed. They are actually significantly underrepresented in police fatalities. If things were spread out equally they would make up 60% of the total deaths by police not 50%. So yes, in whole numbers there are more white people that have died at the hands of police than anyone else but each individual white person is less likely to die at the hands of police than an individual black person. For example, black people are only 13 percent of the population and yet they make up over 26% of the people who were killed by police in 2015. This means, for those that are not math inclined, they are ridiculously over-represented in police fatalities. Look at the chart below. Yes, white people have a higher number of fatalities, but as the largest racial demographic group that is expected. What we must keep track of is the proportions, which you can do by looking at the “difference” in the chart. You will see that these numbers make all the difference.